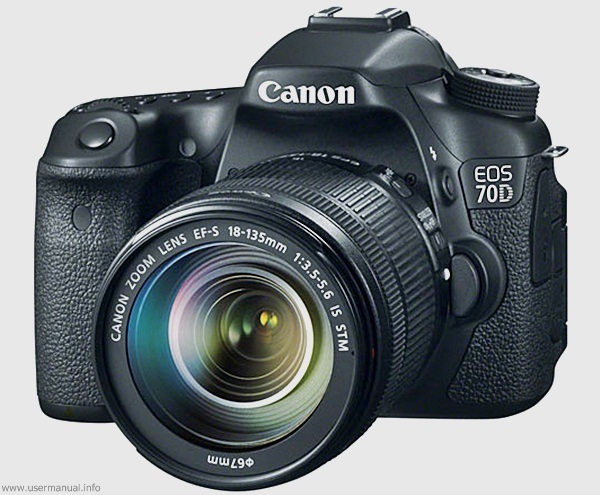 Canon EOS 70D digital slr camera user guide manual – Canon EOS 70D SLR digital camera is latest mid range device for replacement of 60D series with a brand new sensor, focusing in DSLR and come with new improvements featuring Canon Dual pixels CMOS Af (DPA). Canon EOS 70D digital compact camera now offers the viewfinder feature as an electronic level icon and come with great display like EOS 700D with 1040 pixels screen resolution display. Canon EOS 70D digital SLR compact camera equipped with specifications and key features such as: 139 x 104.3 x 78.5 mm in dimension with 750 g in weight, 3.0 capacitive touch technology with inches 20.2 megapixel APS-C CMOS sensor, DSLR camera type, 1800 mAH rechargeable Li-Ion battery. 1080p video resolution, Canon EF and Canon EF-S support and more. Canon EOS 70D digital slr camera user guide manual available to download in pdf file format with 19.3 MB size and contains of 468 pages. Canon EOS 70D digital slr camera user guide manual contains of basic instruction and explanation of features and functions including technical detail of the digital camera. Copyright © 2016 Usermanual.info All Rights Reserved.